As a teacher or school administrator, you want to create the most positive learning environment for your students. You want the students to be engaged, motivated to learn, and happy to be in school. One step you can take to accomplish this goal is to create a safe classroom environment for your students. This involves being prepared for emergency situations as well as organizing your classroom for daily activities. Let’s take a look at four things you can do to make your classroom safe this school year. Before your students step foot in the school, go through your classroom and make sure it’s in compliance with school safety guidelines. Aisles should be clear, windows and doors should be unlocked, and heavy furniture should be secure. Also, dangerous objects like scissors should be put away and out of reach of students. There should be an area for students to put their backpacks in order to keep the floors clear. Once school has started, take the time to go over classroom safety rules with your students. Post this list of rules somewhere visible in the classroom. Common rules include: raising your hand when you have a question, washing your hands, no bullying or name-calling, respecting classroom items, and more. In addition to creating safety rules, it’s also key to show they’re not there just for show. Reward students for exhibiting good, safe classroom behavior. Additionally, don’t be afraid to discipline students who ignore safety guidelines. Lastly, set a positive example as teachers and administrators. Kids look up to you and are more likely to follow the rules if you do too. Before school even begins, meet with fellow faculty members to discuss and walkthrough the school’s emergency plans. Once you have an understanding of them, practice the safety drills with your students. 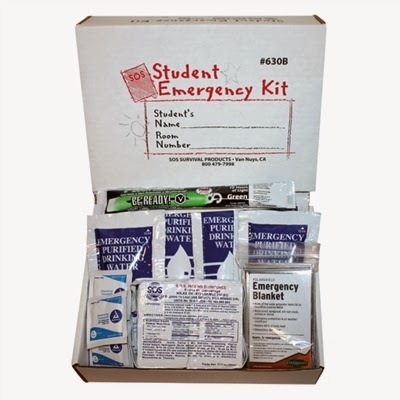 Further, if an emergency does occur, make sure you’re prepared with a school emergency kit. These can be valuable if you’re locked in a classroom or other area for a number of hours. Designate an area in the classroom for emergency kits. Also, SOS Survival Products can help your school stock large quantities of emergency supplies in an outdoor container. Implementing these four school safety tips will help create a positive learning environment for your students. When students feel safe, they’re more likely to respect other students and apply themselves in their studies. This is the goal for every teacher and creating a safe classroom environment is part of the solution.